Wisconsin has three separate voucher programs. The statewide Wisconsin Parental Choice program began in 2013. Enrollment is currently capped at 1,000 students from families that are at or below 185% of the federal poverty level. A full 100% of students attend Christian schools and 73% attend Catholic schools. The Milwaukee Parental Choice Program has grown from 300 students in 1990 to nearly 27,000 students this year who attend private schools, with almost 90% of students attending religious schools. The program grew incrementally by removing enrollment caps and increasing income limits. A similar voucher program was created in Racine in 2011. Families qualify next year for either program if their income is at or below 300% of the federal poverty level, which would be $79,696 for a married couple with two children. What does the budget bill do regarding vouchers? Governor Walker's proposed budget removes the 1,000 student cap on statewide vouchers under the Wisconsin Parental Choice program. This would open the floodgates to sending students to religious schools across the state at taxpayer expense. As FFRF has charged all along, taxpayer-funded vouchers were intended as a foot in the door to a statewide program of subsidizing parochial education. The voucher expansion was sold by snake oil salesmen claiming that "school choice" would save students from "failing" public schools. The proposed voucher expansion is merely the next step in an insidious transition from a public education system to one that favors sending students to religiously segregated schools. What will this do to public education? Public schools will lose critical funding. For example, more than 12,500 students in the Madison Metropolitan School District qualify for free or reduced price lunch, which means, under Walker's budget proposal, that they would be eligible to attend voucher schools. That number is staggering, equaling almost half of the students within the school district. Public schools still must pay their fixed costs and also must provide an education to all students, which includes students with disabilities. How could our public school system continue to operate if untold numbers of students will leave for religious education, taking corresponding state funding with them? The state funding received per pupil goes from the public to the private school. Wisconsin's treasured public school system would be destroyed. How have voucher schools performed in Wisconsin? 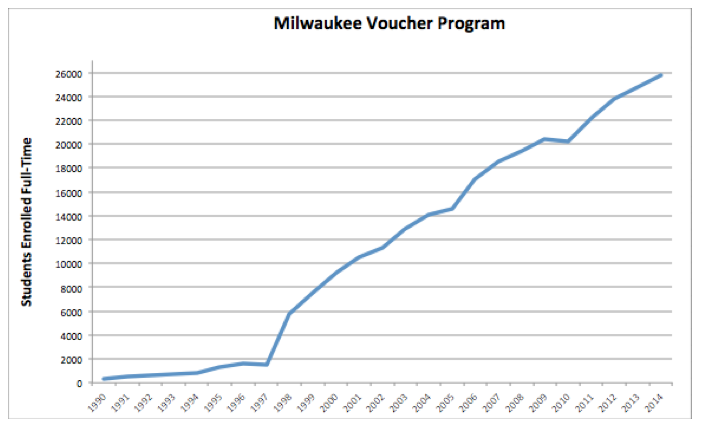 To say that vouchers in Wisconsin have failed is an understatement. In the last ten years, the state has given $139 million to voucher schools that were subsequently barred from the Milwaukee program for failing to meet requirements related to finances, accreditation, student safety and auditing, according to a Wisconsin State Journal analysis last year. Where public funding goes, public accountability must follow. The Milwaukee program serves as a warning as to what happens when taxpayer money is given to private, mostly religious groups that are not answerable to taxpayers. There have been numerous reports of substantial fraud. This includes reports of payments being given for nonexistent students, instructors teaching without college degrees, and school founders stealing money from school coffers. How do voucher students perform compared to public school students? Voucher school students have consistently performed worse than public school students on state exams. There are entire voucher schools in Milwaukee that have only one or two students who test proficient in reading or math. Results from state reading and math exams from last year showed that only 15.5% of Milwaukee voucher students tested proficient in math compared to 19.0% of Milwaukee public school students and 48.6% of students statewide. In reading, the results for voucher schools were 11.9% compared with 14.7% in Milwaukee public schools and 36.6% statewide. What are voucher schools teaching? Observers of voucher schools in Milwaukee have called into question the poor qualifications of teachers, use of outdated books, and whether some schools have any curriculum at all. Some voucher schools have science curriculum that claims to refute "the man-made idea of evolution" and health class instruction for seventh graders about the "sin" of homosexuality. Citizens support public education because it is a public good. That support goes out the window when schools are no longer educating but instead inculcating dogma. What are the implications of a dual-education system? Wisconsin's schools will be increasingly segregated on the basis of religion. As a Wisconsin Supreme Court justice wisely noted in one of the earliest cases keeping religion out of schools: "There is no such source and cause of strife, quarrel, fights, malignant opposition, persecution, and war, and all evil in the state, as religion. Let it once enter our civil affairs, our government would soon be destroyed. Let it once enter our common schools, they would be destroyed." Weiss v. District Board, 44 N.W. 967, 981 (Wis. 1890) (Orton, J., concurring).